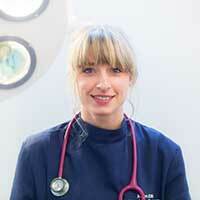 I graduated from Bristol University and realised early in the course that my passion was small animal medicine. I was very lucky to be able to return to my home country of Wales to work with very welcoming colleagues and clients. I have a very spoilt Border Collie who keeps me busy outside of work trying to get her own way. I am enjoying exploring Cardiff as I have recently moved there and am eager to be in the centre of the excitement when the Autumn rugby internationals start.